I had something completely different in mind for this prompt, but then I saw this fabric at JoAnns. When I first started seeing Navajo stuff around I kind of went, "meh" because, as an AZ dweller, I see it a lot and it felt a little boring to me. But I've seen some really gorgeous pieces and outfits lately and I've come around (LOVE the sweater in this post). I needed pocket fabric and happened to have an old bandana in my fabric stash. Perfect! Except the skirt didn't turn out quite like I wanted (fit is weird and pattern doesn't match up at the seams) so I'm probably going to take it apart and start over. Ah, the joys of sewing. Also, I was inspired by that hair twist pic I posted yesterday and decided to give it a try last night for my temple date with Aaron. I loved the way it turned out! That's a trend I'll be embracing whole-heartedly. Link up your embrace-a-trend outfit below. Or you can always add it to the Flickr group! Love that skirt! Your so crazy creative, girl! 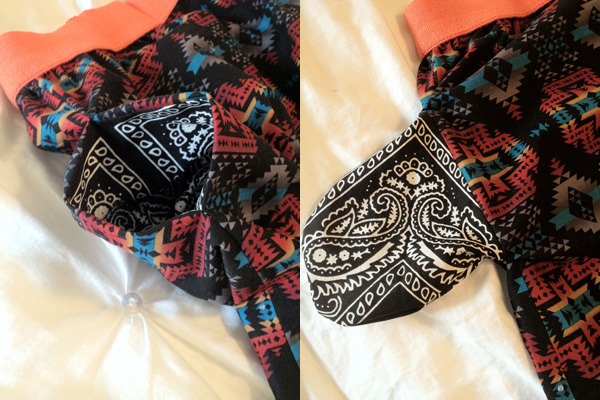 Bandana for a pocket...awesome! New Mexico is the same way with the Navajo prints and turquoise jewelry. Yawn. But I love this skirt - And of course the pockets. Curious what A thought as Simon turns up his nose initially at all things trendy. Especially high waisted pants. Baaahahaha... cowboys and indians. That's hysterical, and super creative! You made that skirt too?! You have some great skills!! the skirt is fabulous! i love the print and the pockets. you look great! btw i tried your suggestion of linking my email to my blogger acct, but i guess i must be more technologically inept that i thought because i can't seem to figure it out. i'll keep working on it! Your hair is amazing. Also, your skirt. Way to go. I really want to learn to sew skirts. That one is amazing! The bandana pocket? Perfect touch! First of all, skirts with pockets rock! Go you for making such a fun skirt!! Haha. Those pockets are seriously perfect! I wish I had your sewing skills! I love the waistband - did you find the elastic that color or dye it? I need to work on my sewing skills. The skirt is awesome! I like the pairing of the bold print with the crisp white shirt. It keeps it from going over the top, you know? I loooved your hair yesterday! Do you twist first and then bun it? You look gorgeous! Love the skirt. So excited about this new challenge! Thank you for hosting another one! I really love what you put together for today's prompt. That skirt is so fun and unique. Lovely! I'm clearly a fan of the navajo stuff since I sort of used it twice this week already. :) Your skirt is fabulous. I'm so sorry I'm so late, Kayla! I promise I'll be better here on out! that skirt is awesome. love the unexpected bandana pockets. I love your skirt! Especially the pockets! I never noticed the red tones in your hair before today - um, can you say GORGEOUS! Love the band choice on that skirt too - that color is unexpected, but looks fabulous with it! I would have never thought to pair those two together. Um, I really want that skirt...or at least the fabric to make one for myself!!! I love that skirt! And you included pockets when you sewed it?! Awesome! I would totally steal that from your closet if I could. :) A skirt with pockets is the best invention ever. Omg, I love the skirt!!!!!! I have to admit I was pretty disappointed to see that you didn't buy it.